No, we're not in Minnesota. The shovel shaped sign is a clue. US President Herbert Hoover once lived here. 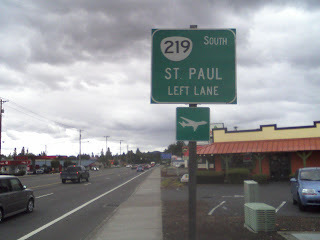 We're in Newberg Oregon on Oregon 99W, also known as the Portland Road, formerly known as US99 and US99W. It’s still called the Herbert Hoover Highway in honor of the 31st President. Hoover spent time in Newberg as a college student at Friends Pacific Academy which beca me George Fox University. The house he lived in, The Hoover-Minthorn House, is now on the National Register of Historic Places. By whatever name you call the road, this section of 99W is a great mix of different road construction eras. In some areas the older northbound lanes goes up and down and around sharp curves with the natural landscape. 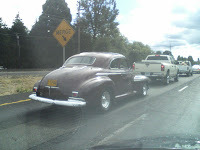 Meanwhile the mostly parrellel southbound lanes are flat and have broad curves of a later era. 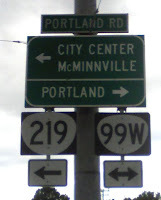 Not too much has changed in the allignment of 99W since I-5 was built in a new location splitting the difference of 99W and 99E. A rare sight is an operating drive-in movie theater. The 99W Drive-In has been around since 1953. They have an on-site indoor theater which may have helped them stay around. 99W is still the main thouoghfaire through the area. It’s often jambed with traffic especially when it drops to a two-lane road though Dundee. There is a plan to bypass both Newberg and Dundee with a new road.